You must be 18 years of age or over to purchase knives, swords, axes or any other article which has a blade. You will be asked to confirm your age during the ordering process and our couriers will require a signature from a person of 18 years of age or older before they will hand over any parcels. You may be asked for proof of age. When you order and purchase Merchandise from Edged Arts you represent that you are of legal age to purchase the Merchandise ordered and that the Merchandise can be purchased and owned in your country, state, county, and/or city of residence. By offering Merchandise for sale, Edged Arts does not represent or warrant that any specific purchaser may legally purchase own, or possess the Merchandise ordered. PLEASE CHECK YOUR LOCAL LAWS. Swords, Knives, and related Edged Arts Merchandise may be dangerous, if used improperly, negligently, and/or illegally. When you purchase Merchandise from Edged Arts, you agree that you will use the purchased Merchandise in a safe and legal manner, consistent with all applicable laws, recognized safety rules, and common sense. The purchase also warrants that he/ she will do all that is reasonable to keep swords, knives and related Merchandise out of the hands of minors and immature individuals for their own protection. When you purchase Merchandise from Edged Arts, you agree to assume all risks related to and/or arising from the ownership and use of the Merchandise and agree to indemnify and hold Edged Arts harmless from any and all claims brought by any person or entity against Edged Arts related to and/or rising from your ownership and/or use of the Merchandise. Our prices are set in British Pounds Sterling (GBP). The prices shown do not include Value Added Tax (VAT). VAT at the current British rate of 20% will be added and displayed during the ordering process and included in the final total price. Orders are usually processed within 5 working days if the item/s are in stock (working days being Monday to Friday inclusive). 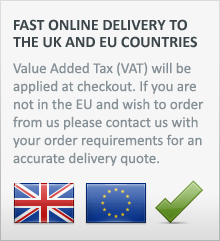 The ordering system on our website is designed to cater for orders from customers within the European Union (EU). Customers who reside in countries that do not form part of the EU are advised to contact Edged Arts via e-mail (info@edged-arts.co.uk) to discuss placing an order or to get advice on where to purchase the products in their own country. Please Note: For shipping to states that do not belong to the European Union it is likely that additional customs and tax charges will be charged when the goods arrive in your country. Our products are depicted as pictures on our website, as is the nature of all online shops. The goods that are actually delivered to our buyers may vary slightly from their picture. We retain the right to exercise alterations and slight colour changes that will aid in the development and improvement of our products. The seller has a right to deliver these slightly altered products to the buyer. Should the merchandise ordered be unavailable, the seller retains the right to not deliver the merchandise. Edged Arts will make every effort to either remove items from our website as and when they are no longer in stock or display clearly on the item page that the item is ‘OUT OF STOCK’. Should an order be placed for an item that is not in stock then the customer will be contacted by Edged Arts and given an estimated delivery date. The customer can then choose if they would like to wait for the item to come back into stock or accept a full refund. Edged Arts is committed to protecting our customer’s personal information. However, in doing business we obtain from you the information we need to complete your transaction. This may include your name, address, telephone, email address, and credit card information. We will not sell, rent, trade, or give away, personally identifiable information entered on this site to any third party. We collect such information so that we can process orders forward product printed material through the mail, or send you latest product updates and other useful material via email. The Edged Arts website may contain links to other sites on the Internet. These sites are not under our control and Edged Arts is not responsible for the privacy practices or the content of these sites. Edged Arts products carry a warranty against defects in workmanship and/ or materials to the invoiced customer for a period of 1 year from the date of purchase from Edged Arts. This warranty applies only when the product is used under conditions for which the product is designed and does not apply to damage related to accident, misuse, improper care, negligence, or normal wear and tear. If you have a warranty issue with your merchandise, please follow instructions below found under our returns policy to obtain your return authorization. If you are not satisfied with your purchase it may be returned within 30 days from when you received it for refund (less shipping costs) or exchange by calling or emailing customer service for a return authorization on info@edged-arts.co.uk or +44 (0)1827 875343. Please Note: All merchandise must arrive in the same new and unused condition they were received, including all original boxes and accessories. If the item is received damaged or faulty then please contact us with details within 7 days of receipt of the item. We cannot accept returns where damage has occurred due to improper care whilst the item was in your possession – e.g. if the item has developed rust that was not present when the item was received. Please see our maintenance section for advice on the proper care and maintenance of blades, armour etc. Edged Arts is not responsible for any returned merchandise that is lost, misdirected, or damaged in transit. We aim to process orders within 5 working days of receipt of the order if the item/s are in stock (working days being Monday to Friday inclusive). Most orders will then be shipped by a next day courier service (e.g. Parcel Force, TNT, City Link). Smaller items (under 1 kg) may be sent by post (e.g. Royal Mail Recorded Delivery). The delivery charge for each order is calculated during the ordering process and will be shown on the screen before the order is finalized. The standard courier delivery charges apply only to deliveries made during the working week (working week being Monday to Friday inclusive). Should you wish to request a Saturday delivery you will need to contact us to arrange this and an additional charge will apply. We do not recommend that you request a Saturday delivery as once the parcel has left our warehouse it could be subject to delays in transit that our beyond our control and we cannot guarantee delivery on a given date. Please Note: Our couriers will require a signature from a person of 18 years of age or older before they will hand over any parcels. You may be asked for proof of age.